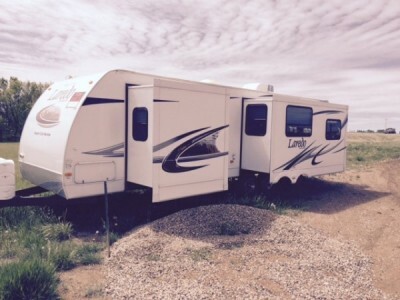 2010 Keystone Laredo 29Ft Trailer. 2 Slide-outs. Bedroom slide-out is huge selling feature. A Must See!! 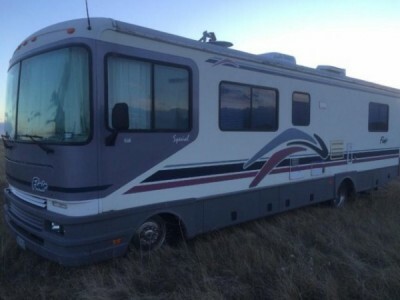 Camper is in great condition. Please call 306-452-7230. 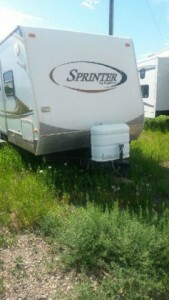 2011 Heartland North Country 29Ft Trailer. 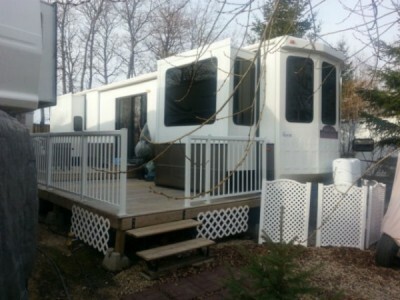 Full length deck and wood burning chimeny, on seasonal lot at Mareen Lake, buyer will have to arrange for lot with campsite owners. 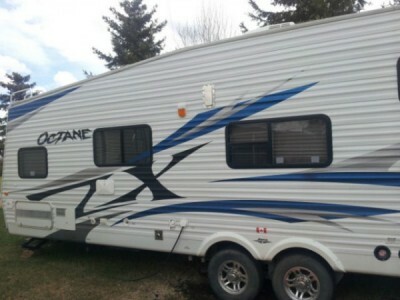 Please call 306-921-4458 for more details. 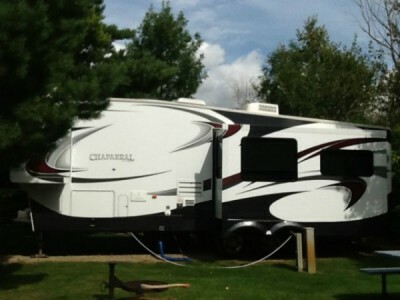 2010 Crossroads Cruiser SK30 Fifthwheel. 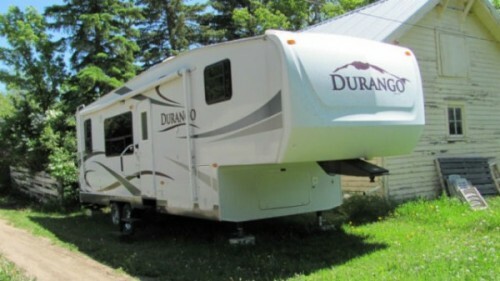 3 slides, polar insulation, large A/C, tire package extra, air mattress in sofa, electric Awning, night & day shades, TV. 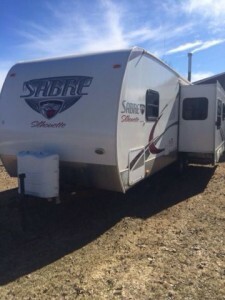 Please call 306-485-7486. 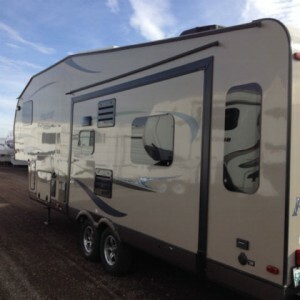 2013 Forest River Flagstaff 31Ft Fifthwheel. 3 slide outs. Solar panel. Dual batteries. Paint sealant protection. DIAMOND PACKAGE. Convenience package. Electric fireplace. Trailer seats 11 comfortably. Two Tv's. Surround sound. Pre-wired for satellite. Great floor plan! Low Milage. NO STONE CHIPS. In show room condition!!! NO TRADES. 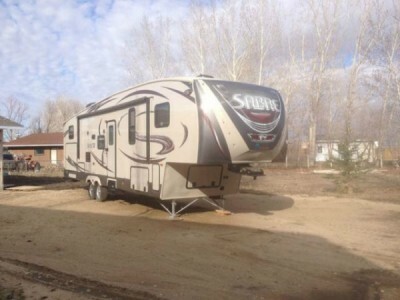 Please contact Don @ 306-535-3559 for further details and showings. 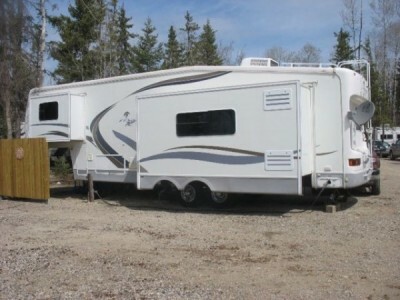 2011 Cedar Creek Cottage Destination Trailer High end trailer with dishwasher, washer/dryer, fire place, electric awning. Please call 306-213-8490. 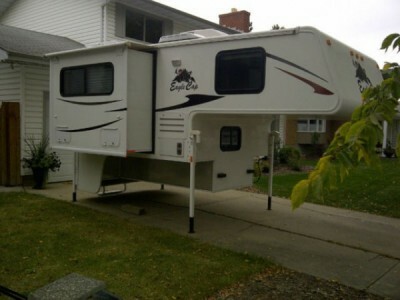 2008 Heartland Big Country 3300RL Fifthwheel. 33 FOOT. Some of the things the trailer has are listed below. Trailer is in great shape. Washer and Dryer hook up, Outside shower, Fireplace, Computer desk, King bed, Triple slide, Full couch with hideabed, Huge storage, 4 chair dinnette, 32' TV with DVD and surround sound, air conditioning, Day and night shades, and much more. Please call 403-801-3774. 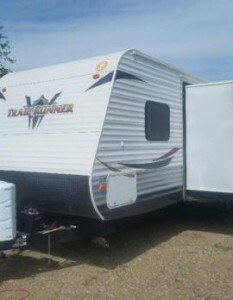 2009 Forest River Salem 38BHDS Trailer. 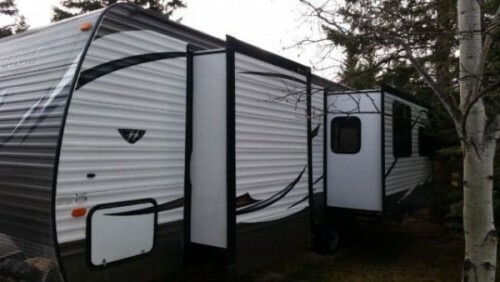 38’ Salem Trailer with quad bunk room. 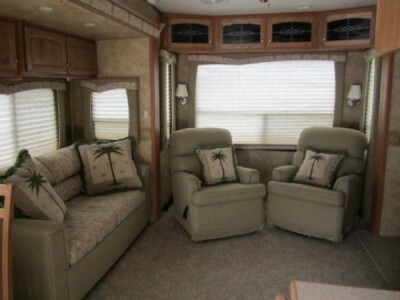 Very roomy (sleeps 10) with many fantastic features including: 2 large slide-outs, Dual air conditioning units, 2 doors, electric awning, new hot water tank, full size fridge, outside shower, sofa bed, skylight dome in bathroom, sink covers, deluxe carpet, King size bed in master bedroom with matching bedspread & throw pillows, TONS of storage, multimedia sound system w/ DVD player, USB, SD and Aux inputs, TV antenna with booster, outside BBQ. Trailer has been parked at our lake lot for the entire time. Please call 780-668-7091. Construction and insulation. One-Piece Insulated Fiberglass Front Cap. Welded aircraft quality 2×2 and 2×4 aluminum frame superstructure. Laminated closed-cell block foam. 3″ crowned roof structure with R-19 insulation. One-piece seamless) insulated roof with 12-year manufacturer warranty. 2″ laminated walls with R-13 insulation factor. 2” laminated floors with R-22 insulation factor. Corrosion resistant LPG compartment. LPG manifold system. Jack brackets bolted through TCC® laminated aluminum super structure. 45⁰ Stainless steel tie-down brackets – bolted through laminated aluminum super structure. Please call 780-968-8551. 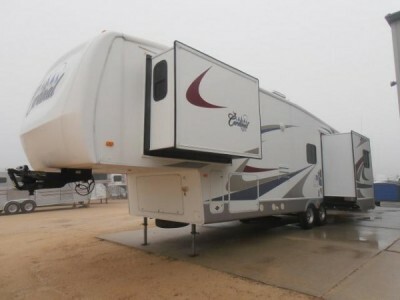 2012 Coachmen Chaparral 310RLTS Fifthwheel. Purchased New Last Year! This unit is in "perfect" shape. 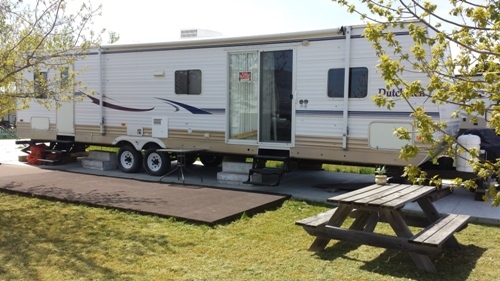 It's 34'9" with 3 slides, electric fireplace w/power up/down 32" flatscreen TV, Corian counter in kitchen,Dual pane windows, fully enclosed underbelly with heated and enclosed dump valves,thermal insulation in slide floors, bedroom & bath deck, R13 -Roof, R-11wall, R-14 floor insulation, 2 "fantastic" fans, 13500 btu roof A/C, 31,000 btu furnace with in floor vents, beautiful millwork throughout, porcelain toilet, queen size walk around bed, extensive under deck storage with "slam style" doors. 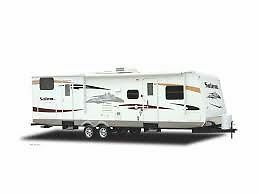 Power Awning, freestanding dinette w/4 chairs, 2 Lazyboy Recliners, "Magic Night" sleep system Sofa, 16' alloy wheels and superduty 6000lb eas lube axles, Premium Partial paint, Power front jacks & best of All a "6 Year Extended Warranty" is included. Original MSRP $51,358 plus taxes Plus the Extended Warranty Cost !! Please call 306-202-6301. 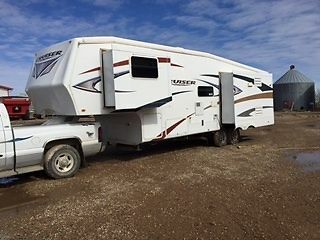 2008 Keystone Challenger 33Ft Fifthwheel. Bunk beds very good shape. 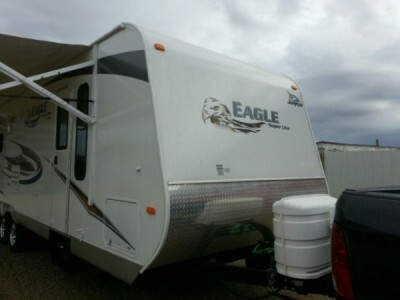 Please call 780-385-1614 for more information. 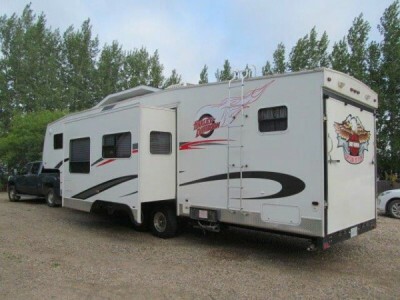 2007 Forest River Cardinal 34TS Fifthwheel. High end. Three slides. King size bed.central vac. Washer dryer ready. Roof mounted Satelite finder. Solid oak cabinets. Corion counter tops.Computer desk. Large electric gas water heater. Heat strip. Large heated waste tanks. smart fan. There are many more features to many to mention. Please call 306-552-7146. 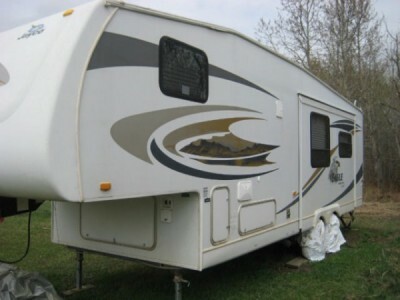 2011 Jayco Octane 24Ft Trailer comes with TV stereo, 2- 6 volt batteries, 4000 watt generator, gas station, air conditioning, everything works, mint condition. Please call 780-237-4724. 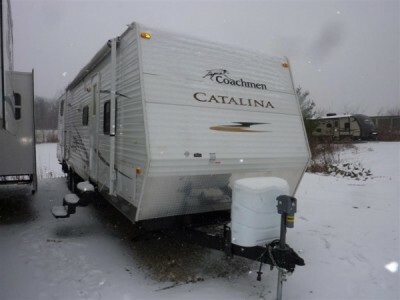 2010 Coachman Catalina 32BHDS Trailer. 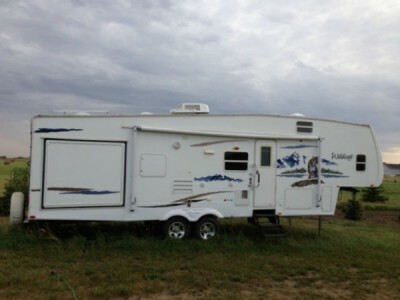 32ft excellent condition. Heavy duty anti-sway hitch. Used two weeks during summers. Sleeps 10. Please call 780-603-0040. 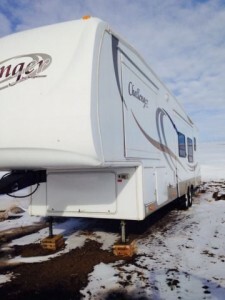 2014 Dutchmen Coleman K2 Summit 249RB Trailer. Coleman K2 summit. 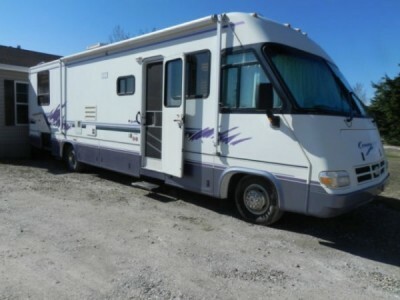 We bought this unit to live in, as we retired and sold everything ! We found our dream home on Lake Okanagan, shortly after delivery. 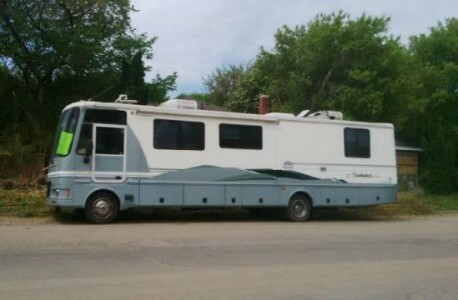 It has never seen a campground. Sask tax paid. 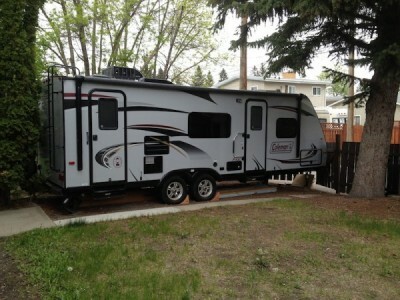 It has been Wrapped & parked in our sons back yard. Still has all the decals an new tags on it. Light fixtures still wrapped. It was listed at 37,900. Has 15 yr lino an roof. all high end finishes. It has forced air furnace ,an winter insulation. 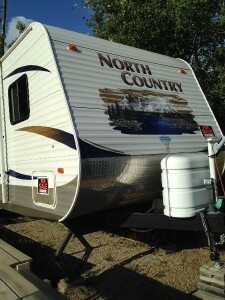 If you want a live in trailer or a high end trailer, or just a really nice unit for at the lake this is worth a look. Please call 250-540-9372.